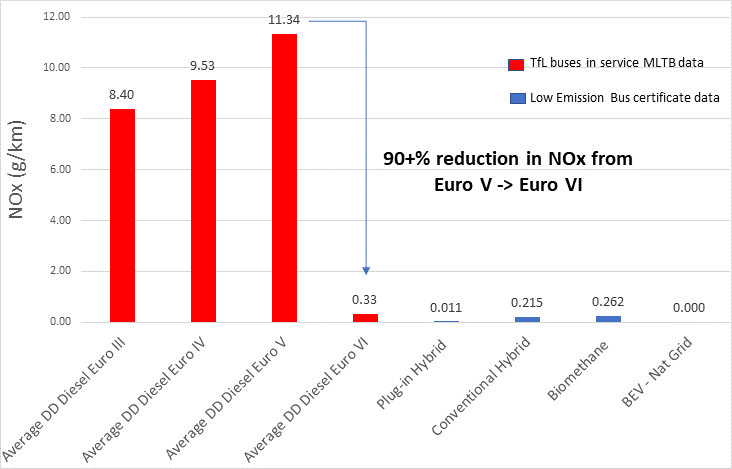 It may not sound like much, but just one of our double decker buses with its Euro 6 engine - carrying upwards of 70 people - gives off far less harmful emissions than a brand new diesel car. And if thousands of people committed to this change it could have a significant impact of the air quality here in Southampton. A standard 5 door car with 4 passengers in it produces twice as much CO2e / passenger km compared to a fully laden bus. SMMT average g CO2 /km for cars produced in 2017 : 121 g CO2/km (source). Assuming 4 passengers in the car, each passenger has 30.25 g CO2 /km. The average occupancy of a car in the UK is around 1.6 people per journey, if 2 people were travelling in a car, then their associated CO2/km would be 60.5 g CO2/km. LowCVP average g CO2e/km for double deck diesel bus at Euro VI in 2017: 1303.9 g CO2 /km. Assuming a passenger capacity of 84, a full bus would result in each km producing 15.52 go CO2/km. A bus that is running at half capacity, has a CO2 impact of 35.2 g CO2/pass km. All bus technologies are clean at Euro VI.